St. Louis, MO – Though some graffiti is considered art, most graffiti is considered vandalism. With only an over-painted floodwall for a canvas, St. Louis artists are looking for new places to paint--whether it's legal or not. Meanwhile, local businesses are trying to keep up appearances. Graffiti drives down property values and makes some neighborhoods look unsafe. Instead of paying for expensive clean up, businesses are now looking into innovative ways to stop the graffiti before it happens. One new product may provide a solution. Stencil graffiti artist Peat Wollaeger spends a few days every year painting over works he's already done. Wollaeger said he always takes a picture of his work before he leaves because he knows it won't last. "That's part of the game, you know. You put it up you're expecting someone to come and paint over your piece," said Wollaeger. Wollaeger and other graffiti artists are allowed to paint on the three-mile-long flood wall in downtown St. Louis, but a local non-profit warns more graffiti is showing up where it's not supposed to be. Mary Lou Green is the executive director for Operation Brightside, a non-profit that works to beautify the city of St. Louis. Green said her organization spends about $200,000 a year cleaning up graffiti in the city. It can take the graffiti eradication team up to 30 minutes to remove large tags. Green said large graffiti is becoming more commonplace. "It used to be people would just put a little tag here and there or scrawl a message across a garage," said Green. "Now, somehow, people are managing to put giant bubble letters and big words. And so, it's requiring a lot more resources for Operation Brightside to remove." The St. Louis Metropolitan Police Department disagrees. It said incidences of tagging have decreased since 2007. However, the department does not keep a detailed record on graffiti. Those who remember the vandalism best are probably the businesses forced to clean it up. General manager for the Roberts Orpheum Theater Michael Jennings said the theater has paid big bucks to clean up graffiti in the past. Three years ago, the infamous Red Foxx (not the comedian) left such a large mark on the Orpheum, the theater had to have the whole south side wall repainted. The job cost the theater almost $10,000. Jennings said the graffiti hurt business at the venue and made some customers feel unsafe. "Despite what is reported every year, crime is not as bad downtown. But it's the really petty, obnoxious stuff that still persists," said Jennings. "And when people see graffiti on a building, it reminds them that we still have people breaking car windows and doing other things that keeps people wanting to stay in the suburbs and not come downtown." Since then, theater employees installed lights and surveillance cameras around the building. Jennings said the system has solved most of the Orpheum's problems. Potter Electric Signal Company in Hazelwood is marketing what the company said is an even smarter solution. Potter's graffiti detection system is designed to hang on the walls of buildings and detect the sound of spray paint using a high-tech microphone. Potter Security Product Manager Scott Holman said the device can be hooked up to almost anything: a phone system, a camera, or even an alarm. "It could trigger an alarm system. It could trigger a communication system which allows you to communicate to police or any type of response that you would like to have," said Holman. Holman said most graffiti deterrents can't catch taggers in the act. "The most standard thing you read about, if you do any research, is paint over it [graffiti] within 24 to 48 hours," said Holman. "So, that's what everyone shoots for. In our case, we can actually give a solution to prosecute and go after the vandal." St. Louis-based company Hackett Security had just started selling the detection system, but 50 devices had already been ordered. Company President Michael Hackett said the devices can cost up to $500, but for businesses that constantly get tagged that's a bargain. "If you're actually cleaning the graffiti out there and having people come through and power wash the building and use solvents to take the paint off or repainting it, you can run into big money quick," said Hackett. Artist Peat Wollaeger said he's skeptical the detection system will really catch taggers. "I just don't think it's realistic, you know," said Wollager. "I mean the cops have too many other things they need to worry about this day and age than a couple of graffiti 'artists' tagging things up." Instead, Wollaeger offers his own solution. "Make more legal walls. 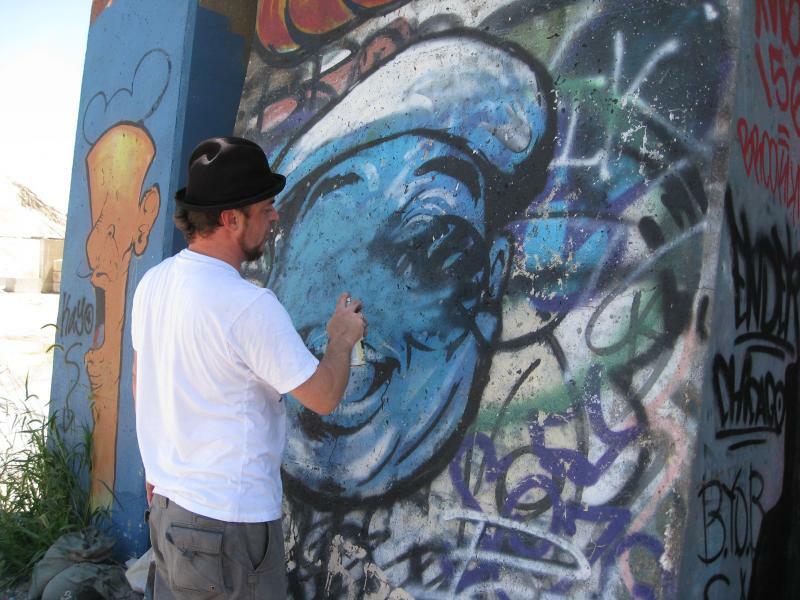 Make more places where people can go and paint and do this type of stuff," said Wollager. "That, to me, would be better time spent. There are plenty of walls in this city that are just barren and dead. And I think if people had locations where they could go and paint, that would be a better solution and that would be a free solution." St. Louis Mayor Francis Slay said while the designated graffiti wall downtown brightens up an otherwise drab structure, it does not help to curb graffiti throughout the city.